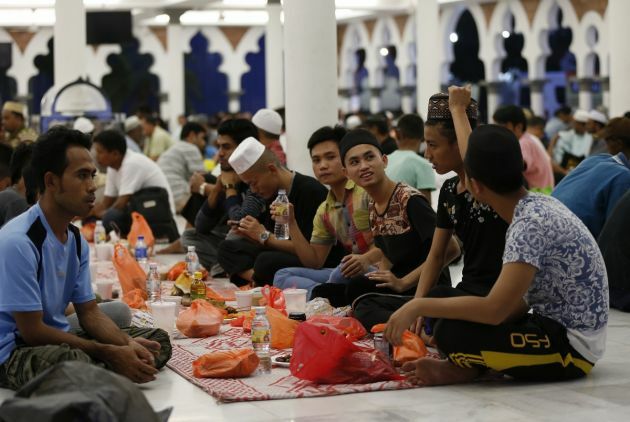 (Photo: REUTERS / Olivia Harris)Muslims wait to break their fast on the last day of Ramadan, at Masjid Jamek (Jamek Mosque) in Kuala Lumpur July 27, 2014. An offensive comment on Facebook about the Muslim holy month of Ramadan and Hari Raya Aidilfitri, the feast of breaking the fast, has resulted in a Malaysian man being sent to prison. Chow Mun Fai, 36, a construction-site supervisor, posted a comment three months ago linking Ramadan, the Devil, and bak kut teh, a local pork dish, forbidden to Muslims, The Rakyat Post reported. The post enraged netizens and prompted many NGOs to lodge a police report against Chow saying he had insulted Islam and the Prophet Muhammad. Known by his facebook name Chow Jack, he reportedly committed the offense on June 12, in the Kuala Lumpur Performing Arts Center, Sentul Park. He was charged under the Sedition Act of 1948 and under the Communications and Multimedia Act of 1998. Islam is Malaysia's biggest religion. Chow's lawyer Ahmad Ridza Noh said Chow pleaded not guilty to sedition and guilty to the indecent postings with the intention to hurt others' feelings. In the court room, Ridza painted a more "human" Chow by laying down personal details about the accused. He revealed that Chow is unmarried, takes care of his parents and is also sick and suffering from tuberculosis and gastric problems. Despite this, the prosecution on Tuesday asked for a maximum penalty with a fine of RM50,000 ($15,655) and a jail term of not more than one year. "This is an issue on public policy and interest which demands for severe punishment to be imposed, as it will serve as a lesson to those who may act the same in the future," said Public Prosecutor Suhaimi Ibrahim. Kuala Lumpur Sessions Court Judge Azman Mustapha agreed with the prosecution and said the decision shows that people cannot hide behind social media when making careless statements. Malaysia has been critical of social media posts and has been criticized by some for not fully supporting free speech. In August month, a Malaysian teenager sparked uproar for "liking" an "I love Israel" Facebook page. Several months ago it banned the use of the word "Allah," the equivalent of "God" in the Malay language, by all non-Muslims.